The Scheduler and MatchServer are Windows services and do not include any hardware. 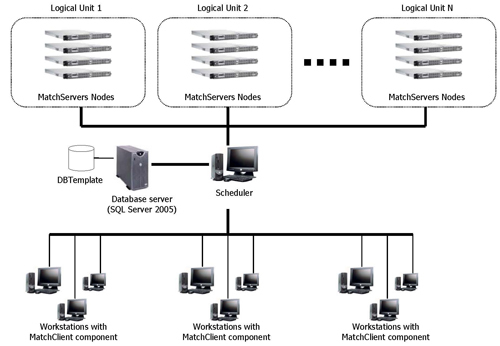 The Scheduler controls one or more clusters called Logical Units (LU) that may contain one or more MatchServer Nodes (MS) working in parallel in cluster architecture. The workstations with the MatchClient (MC) component send tasks to the Scheduler. The Scheduler checks which LU is not busy and assigns the task. The MS nodes on that LU, each with its portion of the database in RAM, works on the task and returns a result. The Scheduler updates the database (DBTemplate in the demonstration) and returns information to the workstation MC. The Scheduler uses one instance of a Microsoft SQL Server database to store the identity records. The Scheduler controls one or more LUi (where i=1 to N) working in parallel. Each LUi contains all templates in RAM distributed among the MS in that cluster. The Scheduler controls the matching tasks, and manages the distribution of the matching resources in order to optimize the response time. See the diagram below.